Freemuse.org promotes the idea of musical expression without limitation, the way it should be. Presenting ideas from around the world, the site connects one creative musician with another. One of the countless ways freemuse.org is able to establish this connection is with its Reading Room. This section of their site presents articles and speeches saturated with an intense longing for musical expression displayed by those who have and have not been restricted by outside criticism or their circumstances. One other major topic covered by this site is censorship. For those who feel a tad ashamed at not knowing what “Baroque” really means, “Essentials of Music” provides a fountain of knowledge to bring a reader’s Classical Music IQ up to par. It offers its visitors historical and stylistic information about each of the major classical music eras, from the Middle Ages through 20th Century, as well as a key-terms glossary and sound clips of works by major composers. Home to the “World’s Leading Opera Magazine,” opera fans around the globe can visit here for the latest info on this classical art. With the magazine’s latest news, interviews, performances, CDs, and book reviews, as well as listings for all major opera-houses, there is definitely no need to go anywhere else. As if that were not enough, the site even offers visitors programs for upcoming performance seasons. 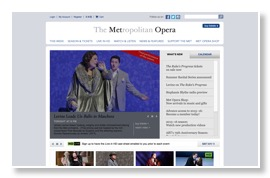 Metoperafamily.org was established to make any information related to The Metropolitan Opera available to its enthusiasts. In addition to informing those interested in opera about upcoming shows, the site enlightens its adult visitors on how they can be more than opera attendees; they can also educate their own children about the opera thanks to the Opera Guild Education Department. 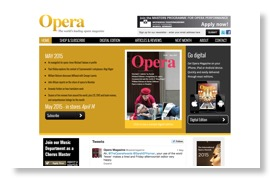 Visitors can learn more about this and recent opera news when they visit this site and the many features it offers. Editor's Note: These reviews have been featured in a previous issue.